If you read the news (or at least glance at the “trending” section of your Facebook feed), you probably know that Pope Francis is in the U.S. this week. Like many others around the world, Catholic and non-Catholic, I am drawn to this pope who lives as simply as is pontifically possible and preaches a message of acceptance, grace, and care for the poor. As a Catholic, I believe it is part of my Christian mission to serve the poor, and it’s been inspiring to see the pope here advocating for us Americans to do so. I certainly wish I did so more often. As a Catholic Christian, I also believe in having an across-the-board pro-life platform–meaning that if I’m going to oppose abortion, I need to extend that position into reality by helping those who choose life for their unborn children. Yesterday I had the opportunity, in a small way with a group of friends, to take up both of these challenges. Save the Family, a local non-profit where I do some volunteering, offers a program that that helps homeless families get back on their feet. Save the Family provides their clients with housing, classes for job readiness, interviewing skills, or getting a GED, as well as many other resources. 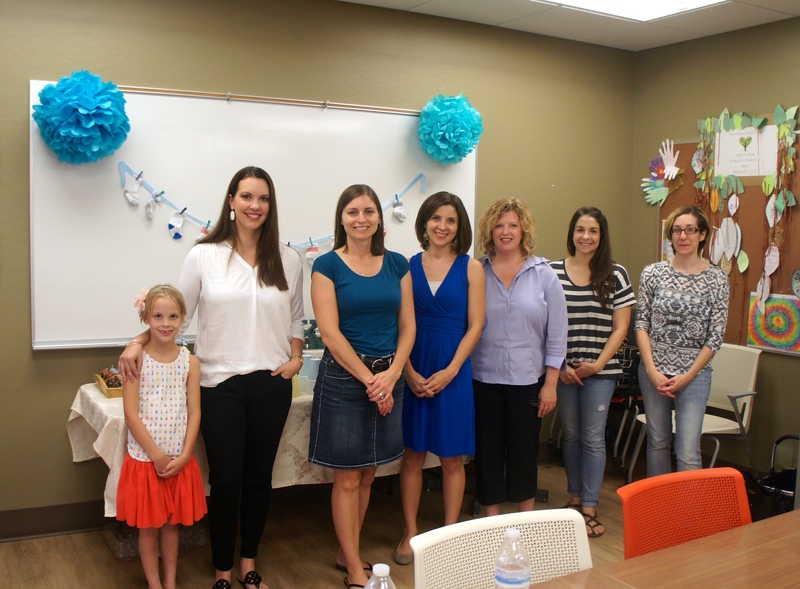 One way volunteers can get involved in the process is by hosting baby showers for clients who have recently had a baby. To me, it seems like a wonderful way to bless a fellow mom who is in great need, and promote a culture that welcomes new life even when circumstances are difficult. Having attended some of these showers in the past, I decided to host one myself. It was a really special evening I was honored to share with a group of treasured friends. The client went home with a van-load of baby necessities, and hopefully with a sense of support and love from our little group. I thought I’d share some of the decorating, game, and food ideas from the shower–which could of course be used for any baby shower! However, if you agree that throwing a shower for a mother in need is a great idea, and you live in the Phoenix area, check out Save the Family and throw one for one of their clients! My main intent in planning decor for this shower was that almost every decoration would be something the mom could keep and use for her baby boy. Except for a few incidentals, this worked out really well. I’ve seen diaper cakes, diaper wreaths, and even diaper owls (wha?) used at showers and touted on Pinterest. Here’s my take on the theme of using diapers as decorations: the diaper tree. Or diaper flower pot, maybe? 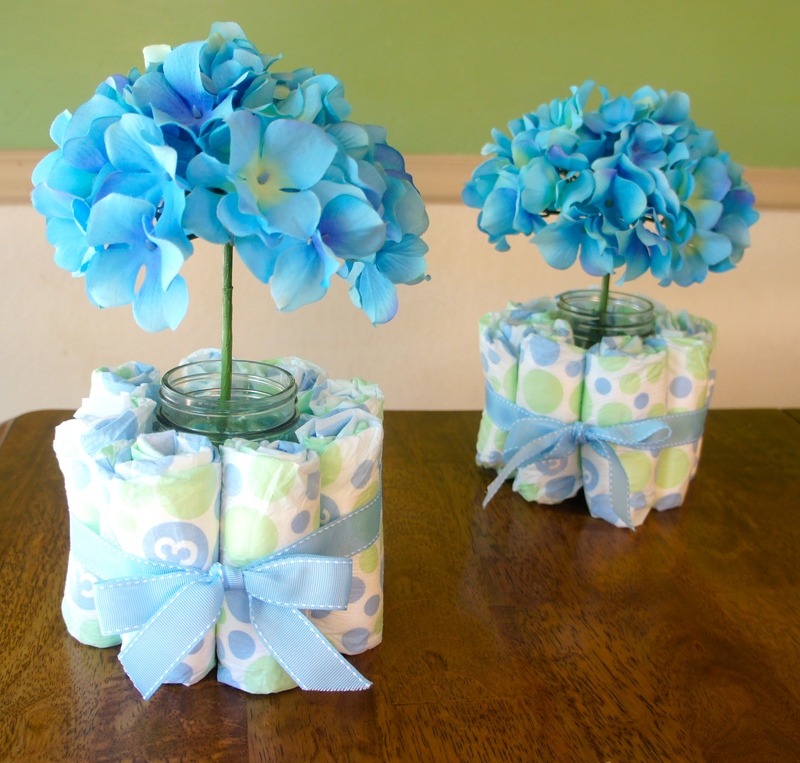 Pretty simple–rolled up diapers held in place with ribbon around a Mason jar. I popped some floral foam in the jar and stuck a large silk hydrangea in it. Boom! Diaper tree. Well, talk about easy baby shower decor. Easy and giftable. Ribbon, clothespins, baby socks, annnnnd done. 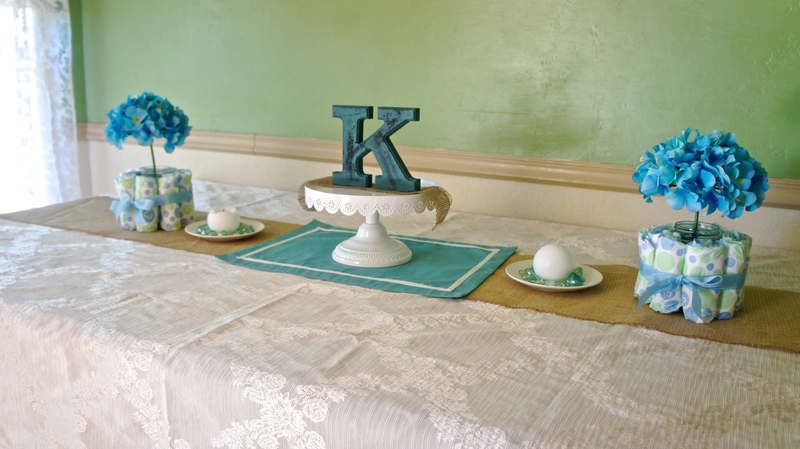 Our little guest of honor’s name at the shower started with ‘K,’ so (hoping the mom could use this in his room, perhaps?) I went with a monogram centerpiece. 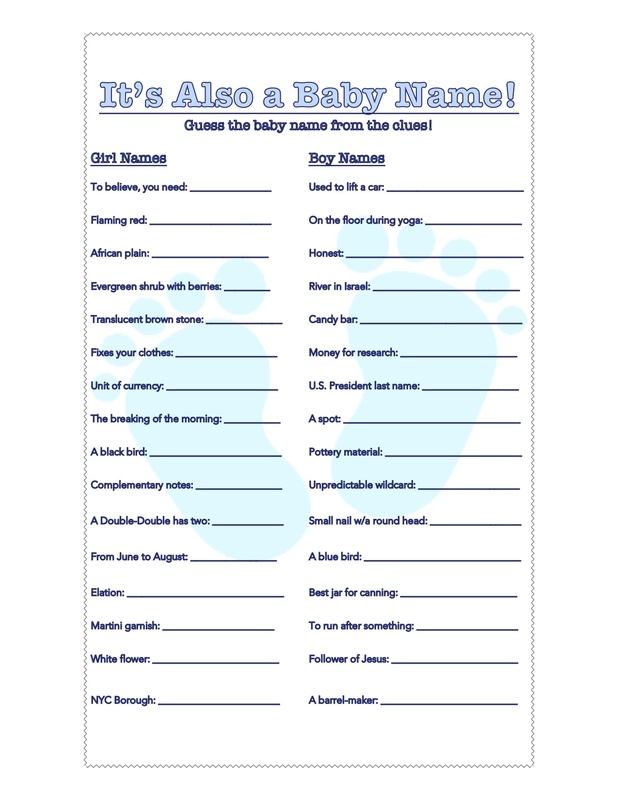 Naturally, this only works if you know the baby’s name….or maybe if you’re trying to drop a subtle suggestion of what you want the baby’s name to be. For a door hanger, I made this little “Welcome Baby” sign with a small section of beadboard, ribbon, wooden stars, and sticker letters. (Translation: I went a little craft-crazy at Michael’s.) Again, re-usable as nursery decor. Okay, not typically giftable, but dang if these things aren’t festive! And actually, in this case, these ended up getting gifted to the client. She said she could re-use them for another child’s birthday party. Yay! Lastly, for one of the tablecloths, I used a baby blanket, which the client got to keep as a gift, too. The shower menu was a collaboration between several of the invitees and myself. It came together for a nice well-rounded meal that pleased this nutritionist-in-training. For dessert, I knew I wasn’t in the market for a splurge on custom cupcakes, so I tried for the next-best thing: cupcakes with a custom topper. 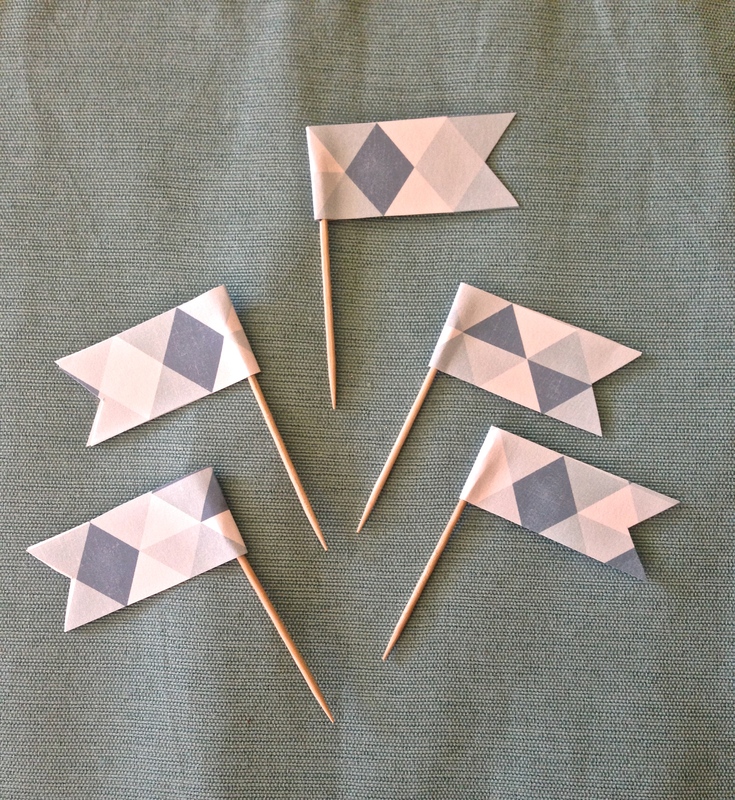 Some craft paper, double-stick tape, and toothpicks whipped up these little blue cupcake flags. They day of the shower, I picked up two dozen grocery store cupcakes and topped them with the flags. A little pop on top for instant festivity. Shower games: you either love them or hate them, right? Hoping to keep guests happy, I aimed to go with games that were more lovable than hate-able. No one had to eat chocolate out of a diaper or waddle through an obstacle course with a watermelon between their thighs, so I’d call that a success right there. I personally love word games, and sheets of paper with word games on them sure are easy to transport, which is a major benefit when throwing a shower somewhere other than your home. We started off with an icebreaker of Baby Mad Gab–just a little something fun for people to try to work out as we got our food and sat down. If you’ve never played Mad Gab, the basic idea is that what looks like random words strung together can really sound like another phrase. “Dirt Deed Hyper”? Dirty diaper! “Bundt Uh Loaf Joey”? Bundle of joy! Once you figure it out, you can’t un-hear it. Below is a printable I made with an answer key. Next up we had another word game called It’s Also a Baby Name. You know how a lot of names are also nouns, like Faith, Hope, and Charity? And Dump Truck and Tadpole and whatever else people are naming their kids these days? This game is based off that idea. Printable and answer key below! 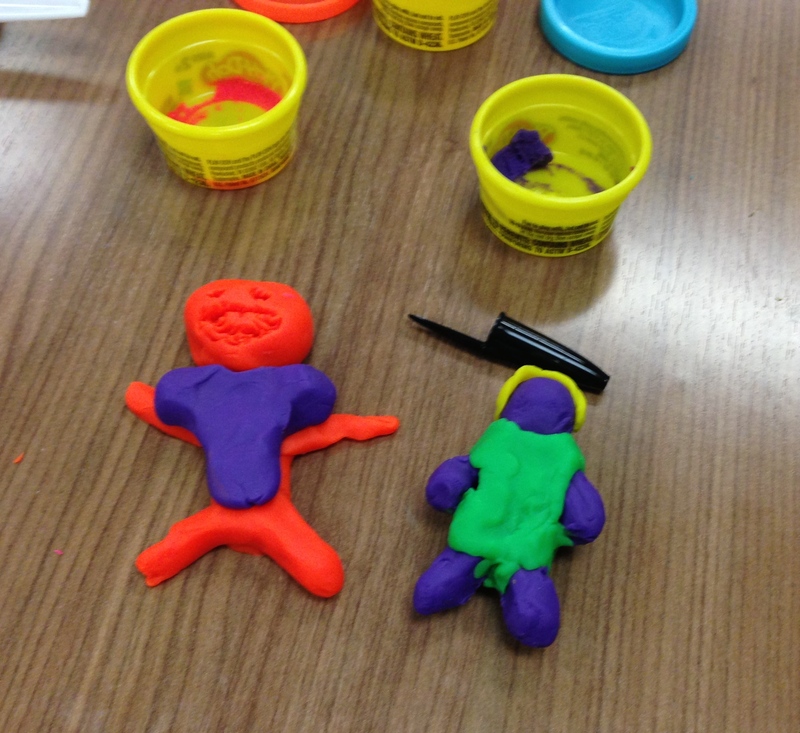 Lastly, everyone got to enjoy a round of Play-Doh Baby, which is as simple as it sounds. 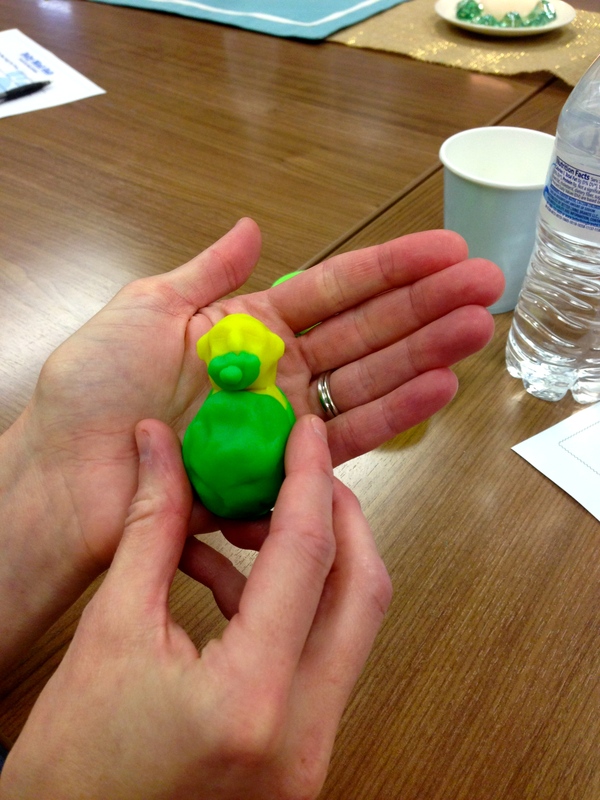 Make your best baby out of Play-Doh and the guest of honor gets to choose the winner. We had some pretty adorable (and some pretty freaky) babies. I think my favorite part of this game was when I asked my friend Bekah, “Hey, are you still working on making a baby other there?” Ummm, that came out wrong. So there you have it. I would absolutely do this event again! It truly blessed my heart to see this momma in need drive away with so many wonderful gifts for her sweet little guy, and to see my group of friends come together to make it happen. Thank you so much to all of you ladies, and for anyone else reading, be sure to check out Save the Family! Wow, this is such a wonderful idea, I would love to do this sometime!! Thank you for sharing! Thanks, Laurel! Save the Family would love to have your participation! I’m always trying to get my husband to eat chickpeas with no real success. 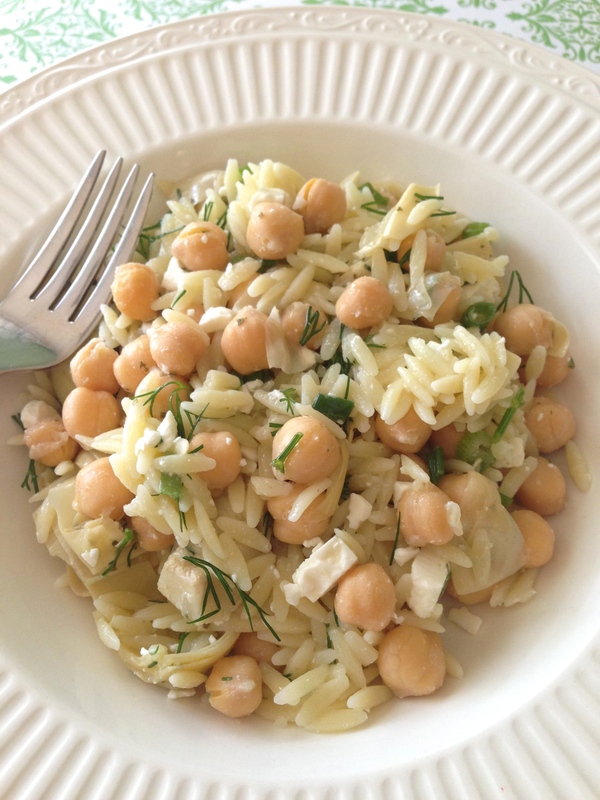 Your Lemon-Dill Orzo with Chickpeas and Artichokes might actually be the recipe to help him turn the corner. Thanks!